The first day was difficult. The day before, Dr. George Tiller, the infamous abortion doctor from Wichita, was murdered at his church (for more on that including my statement on violence, see my Special May Update). I read the news saying that President Obama had released Federal Marshals to “several key facilities”. 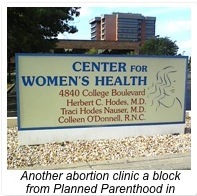 I feared that this abortion clinic might be a “key facility” because of its proximity to Wichita and that we would be hindered in our prayers. However, when we got to the clinic it was completely quite, thank God! The only thing that was different is everyone wore bulletproof vests as they came out of the clinic. I was so thankful that we were able to continue in silent prayer. On the second day, as we left IHOP, the sky was filled with dark storm clouds. I prayed asking God to hold off the rain. I told our crew the story of our siege in 2005 when it rained all around us but not on us (see my June 2005 Newsletter for more)! However, this would not be one of those days! It began to pour. I had a poncho in my bag. However, others were not so blessed. So, three of us huddled underneath my poncho. I have to confess—we did leave about fifteen minutes early. However, before we left I looked inside the window of the abortion clinic. Several workers stood at the window just staring at us in wonder. I am not sure if they were amazed or thought we were incredibly foolish. Maybe both. But they certainly had looks of astonishment. On the eighth day, it rained again. 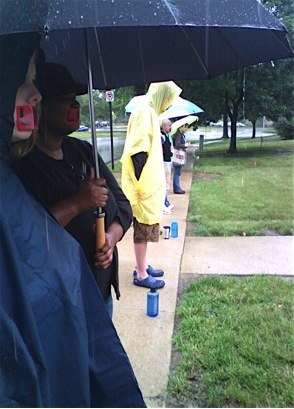 This time, our crew came prepared with rain gear! But, the rain was even harder. It was glorious remembering Paul’s words (even though it is hardly even anything close to what he went through! ), “I am glad when I suffer for you in body for I am completing that which remains of Christ’s suffering for His body, the church.” (Colossians 1:24) Even if it was a small part, it was worth our suffering to see the lives of babies saved. On the third day, a man in his late fifties joined us. Except, he wasn’t standing with us. He was standing with a shirt that read, “I am a friend of Planned Parenthood”. At the end of Silent Prayer Sieges we always take communion together and pray. We walked a ways away from him, took communion and prayed for him. At the end, my friend and the leader of Bound4LIFE KC looked at me saying, “let’s go talk to him”. I was hesitant considering the debate and tension that could have ensued, but I agreed. We introduced ourselves extending our hands to shake his hand. He refused. He went on to describe how he had sent someone to jail for hitting him over the head with a demonstrators picket, and how over the past twenty-five years, he has been abused, yelled at with megaphones, and been the recipient of lies told by anti-abortion protesters. We apologized to him. He told him, “Not all Pro-LIFE people are cut from the same cloth.” We began walking back to our cars. Surprisingly, he walked back with us. We small talked trying our best to show the love of Jesus. I believe God has marked this man with a new kind of Pro-LIFE. One that loves its enemies living out the Sermon on the Mount (though we are weak at it for sure!) Please join us in praying for a revelation of Christ to come to this man (Eph. 1:17). This fall, God has touched our hearts with a vision to begin sieging on Sundays standing on behalf of the church in repentance for our silence on the issue of abortion. I will be helping to lead a team sieging from 3-5 pm as part of our outreach for the Justice Program. 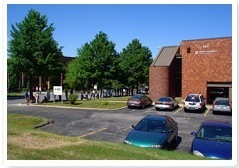 We are also going to serve a local crisis pregnancy center. I have been in close contact with them for the past few months and have become friends with the director of the center. I am looking forward to finally being able to serve them regularly. 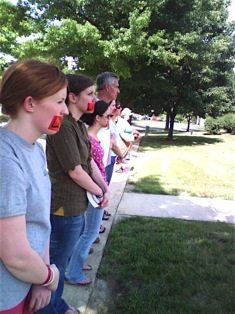 We have also been praying about expanding our sieging to the other three abortion clinics in Kansas City. Please pray for us as we seek the direction of the Lord on this. I just finished my first week in the Justice Program. I am loving it so much! My homework is reading the Bible. I have never been to a school like this. They are actually teaching me how to study the Bible! This is going to be an incredible two years.